The labels are Black and Yellow Parlophone in design with "The Gramophone Co Ltd" perimeter text, "Sold In The UK" text across the centre and the 'KT' tax code on side one. The vinyl is stunning near 'as new'. This is one owner copy with barely a hint of play by the spindle hole. Amazing! The Garrod & Lofthouse gatefold sleeve is fully laminated with internal flipbacks, & as mentioned it is the wide spine variant. The condition of the sleeve is superb and, apart from some minor laminate creasing or light edge scuffing, we would grade the cover Excellent. The flipbacks are secure & there is no 'Patents Pending' text on the back, with mono references only. 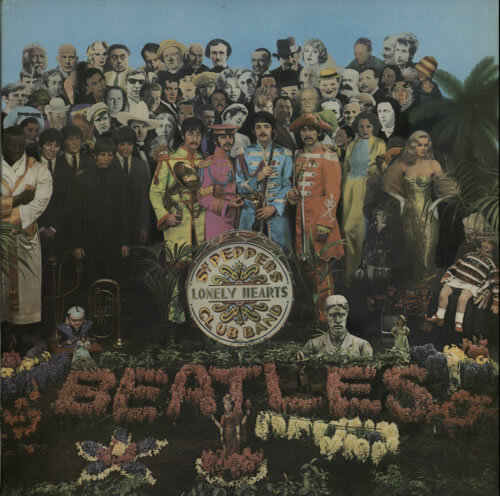 As rumour has it, the wide spine variants were printed when The Beatles wished to include an envelope of goodies with the album, but this was later replaced by the sheet of cutouts. This sounds plausible but is only rumour as far as we know. The wide spines were certainly among the first sleeves issued, so it would fit with that theory, even if it cannot be confirmed. The 'flame' inner is NOT included with this copy. We often find the record with & without & store spare inners when we can but there is no definitive evidence that it came with all first pressings. Instead, a plain white 'Patents Applied For' sleeve is included. The vinyl really is stunning near MINT. On very close inspection, you can see once tiny trace of spindle by the centre hole to suggest one play or two. A beautiful example! Product Information The Beatles Sgt. Pepper's - Wide Spine UK vinyl LP album (LP record).